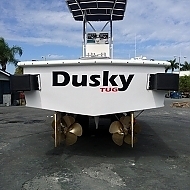 This Dusky 26 was special ordered and custom designed specifically for use as a tug boat. This work horse offers a wide beam of 11' 3", twin 330HP John Deere motors, 32" bronze 5 bladed props with stainless steel shafts, bronze rudders, a keel cooler and wet exhaust. This boat will be put into use in West Palm Beach, Florida; so keep an eye out for her.